Fact Check: Is Donald Trump or Barack Obama Responsible for Our Current Economy? This led Trump to hit back at Obama last night by retweeting a tweet by conservative TV commentator Eric Bolling, which claimed that Trump deserved credit for America’s unemployment rate, GDP, wage growth, black employment rate, hispanic employment rate, and employment rate for women, while giving absolutely no credit to Obama. Fact is, the economic recovery did begin with Obama, almost immediately after he took office but you don’t have to take my word for it because statistics speak for themselves. Let’s analyze the U.S. unemployment rate as a means to measure the health of the U.S. economy over the course of the Obama and Trump presidencies. Below you will find a chart for the civilian unemployment rate from the U.S. Department of Labor. When President Obama took office in January of 2009, the unemployment rate stood at 7.8% and was climbing steadily. 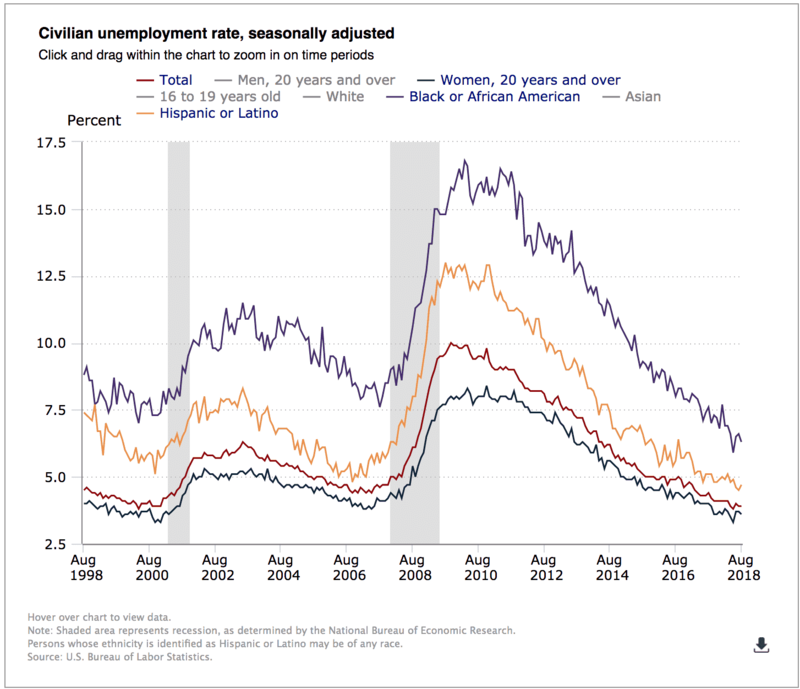 The African American unemployment rate stood at 12.7%, while the employment rate for Hispanics was 10.1% and the female unemployment rate was 6.5%. As you can see, unemployment increased for approximately 8 months after Obama took office, after having been shooting up under President George W. Bush for the previous 18 months. It’s almost impossible to conclude that Obama had much to do with the 8 month continuance of Bush’s economy, as he had a chance to implement very little policy in this short amount of time, and even if he had made major policy changes the instant he became President, the economy would not have reacted instantaneously. The next 7 years and 4 months of Obama’s presidency saw the unemployment rate decrease sharply. In fact, from its peak in November of 2009 until when he left office, the United States saw the unemployment rate decrease from 10.0% all the way down to 4.8%. That’s an astounding 5.2 point drop (52%) in the unemployment rate. There is no arguing the fact that the economy has improved under President Trump, but the falling rate of unemployment has actually, to some extent, leveled off under Trump. It has continued to fall, but if you view the chart above you will see that the downward slope of the trend line has become less prominent since Trump’s inauguration. I wouldn’t blame this on Trump though. It’s rather the fact that unemployment has reached such a low level that it is nearly impossible to see it fall much farther. Since Trump’s inauguration, the unemployment rate for all people, including minorities and women, has continued to fall. Overall unemployment, which peaked at 10.0% under Obama, dropped all the way to 4.8% during Obama’s two terms. It then has continued to drop from 4.8% to 3.9% under Trump. The African American unemployment rate, which dropped from its peak of 16.8% to 7.8% under Obama, has fallen from 7.8% to 6.3% under Trump. The Hispanic unemployment rate which dropped from its peak of 13.0% to 5.9% under Obama, has fallen from 5.9% to 4.7% under Trump. The female unemployment rate which dropped from its peak of 8.3% to 4.4% under Obama, has fallen from 4.4% to 3.6% under Trump. If you are going to hold the President of the United State responsible for our current unemployment rate, you must go back to when the unemployment rate began its descent. That was back in 2009 under President Obama. Obama did what few presidents in the past have been able to do when it comes to cutting unemployment. The drops in unemployment under President Obama are significantly greater and have happened at a faster rate than the drops under President Trump. The argument by Republicans that Obama has nothing to do with our current economy is both outlandish and completely ridiculous. Obama brought us out of one of America’s greatest recessions and to an economy that had saw a healthy unemployment rate. Trump has taken over and the economy has continued to improve, but based on the unemployment rate alone, at a slower pace than under his predecessor. We must keep in mind that the unemployment rate is just one of numerous economic indicators, but numbers don’t lie. People do. FACT CHECK: Both Presidents are responsible for our current unemployment rate. President Obama saw the unemployment rate decrease at a greater rate than President Trump did. Obama saw civilian unemployment rate decrease by 5.2% in 7 years and 4 months (88 months). President Trump has seen it decrease by 0.9% in 20 months. This represents a drop of 0.059 points per month under Obama vs. a 0.045 point drop per month under Trump.